Unless you’re limiting yourself to sending Christmas cards to those within a four mile radius of yourself, you’ve probably missed the last post date. And whilst eCards are a (crap) option, they’re not terribly personal. 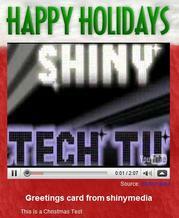 YouTube has a solution, since they’ve launched a video Christmas card service. You can choose from one of their suggested Christmas videos, one of yours you’ve already uploaded, or create one from scratch. You then stick in a message, select a Christmas-y background, choose up to 25 email addresses and hit go. Sweet, in a ‘yeah, I missed the last post but do have a webcam’ kind of way. It’s kinda sweet, and is probably perfect for people with friends and relations far, far away.